The HRN audience is getting younger (according to YouTube). 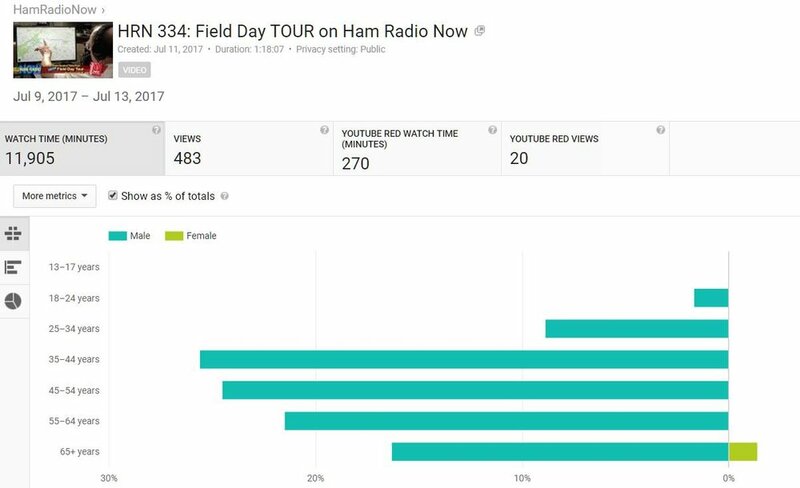 This chart shows the age/gender range for the Field Day Tour show after the first 450 or so viewers watched the program. Why the change? Well, you tell me... obviously we've had a bunch of younger hams on the show. Maybe not being stuffy old hams helps (I'm old, but I don't think I'm stuffy). But really, you tell me in the comments. Audience numbers (view counts) are erratic, but trending up a little. The audio audience is growing a lot, from a couple hundred downloads last year to averaging around 800 so far this year. I don't have audio numbers for previous years - only since we started really 'podcasting' using Libsyn. I don't know if we're chasing some old-timers away or not. I don't deliberately want to do that. I do want to deliberately attract the next generation. Can you do both? The second chart is the Audience Retention graph for the show. It's the data that shows you shouldn't pay much attention to the "view count" of this or any longer form show on YouTube. Notice that about half the audience is gone by the 4-minute mark. That's typical. What's unusual about this show is that the audience stays well above the 25% line until the very end. That's because this is a documentary type show (and a very visual one at that), and things change about every 10 minutes. Our talk shows hover at or just below the 25% line after the first 10 minutes. That tells me that you like, and are engaged by, the documentaries more than the talk shows. No surprise there. Unfortunately, the ham radio community isn't willing to pay for them. That show took the weekend to shoot (and a few hundred $ in travel expenses), and about 60 hours to edit (spread over two weeks, with a couple of 'talk' shows produced in between). A typical 'talk show' takes a couple hours to record, another few hours to edit (mostly adding titles), and a couple more to upload and promote on the web site, Facebook, Twitter, Patreon, Yahoo (a mailing list - are you on it? ), Reddit and QRZ.com. So 6-8 hours vs. 60. And no out-of-pocket expenses. Of course, we do have some very dedicated and generous fans who support the show financially ‒ some dramatically (several hundred dollars a year!). PBS would be jealous of our ratio, if they knew we existed. And frankly you (all the contributors) are what keep the show alive. Well, that and my ego. The 'view counts' - especially coupled with 'audience retention' - wouldn't make it worth the effort. That's my effort. If you've been watching carefully (and are in the 25%), you may have noticed that David Goldenberg W0DHG is gearing up to produce some shows on his own. If I feel that this pond is a little too small and getting crowded, he's going to splash around and have fun. I'm looking forward to it. That will happen sooner than later, as I'll be away from the show for a good part of September (and lapping into August and October). That will include going to St. Louis to record the 2017 DCC, and that means being busy for the next few months after that producing those shows. If all goes well (and when does that ever happen? ), David will be able to keep new shows going in that big gap.